January 13, 2019 – Ar-Dale Dancers “Fifties” Square Dance, White Bear Lake, Caller Larry Fruetel, Cuer Ken LaBau. Dancers from Westonka Whirlers, Spares & Pairs, South Metro Stars, Single Circles, Hot Foot Stompers, Friendly Twirlers, Dan’se P.A.C., Dakota Grand Squares, County Line Squares, Cambridge Corners, and Ar-Dale Dancers were present. Also present were Friendly Twirlers Queen Michelle, Ar-Dale Dancers Queen Tami and King Rick, CSD Chair Vince Dahlheimer, CSD Treasurer Bernadette McNeil, SDM Executive Director LeRoy Elfmann, SDM Historian Al Martin, SDM Marketing Director Dee Scott, and SDM Membership Director Mary Kay Amberg. 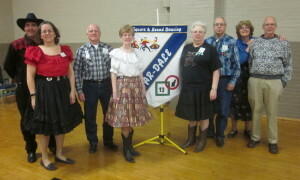 County Line Squares claimed an Ar-Dale Dancers banner.